The Parrys International Wolves launched a brave fightback as they looked to get their first league points on the board. But Rockets duo Chris Harris and Scott Nicholls struck a 5-1 in the final race to ensure Peter Adams' side travelled back to the West Midlands empty handed. It was a frustrating result for the Monmore men, and team boss Adams admitted a consolation point could have been “very valuable”. “It was a very competitive meeting, and it was great to see a big crowd in the stadium,” Adams said. “They were telling me they've not seen a crowd like that there for quite some time, so that's fantastic for the sport and after seeing a meeting like that you'd hope they'll be back. “We got off to a strong start, and although we let it slip in the middle of the meeting a tactical ride win from Kyle Howarth put us right back in it. Howarth top scored for the visitors, continuing his impressive start to the season with a 13-point haul. Skipper Freddie Lindgren bagged paid double figures after partnering Howarth to a 5-1 in the opening race, whilst Adam Skornicki ended a solid night with an important race win. Sam Masters and Jacob Thorssell both endured mixed evenings but contributed vital points, but reserve duo Nathan Greaves and Max Clegg struggled at reserve around the tricky Rye House track. 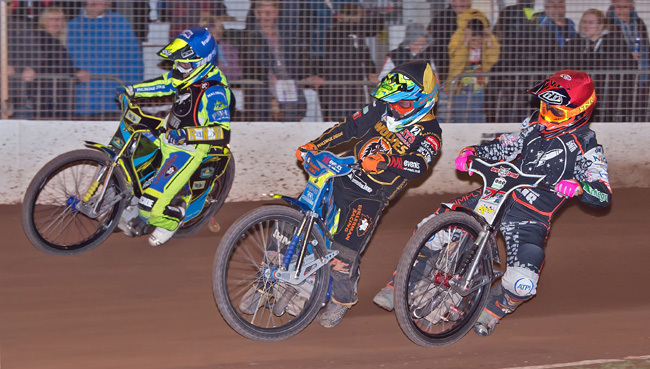 Wolves will be back in action in their first SGB Premiership home meeting as Leicester visit Monmore Green on Monday (7.30). RYE HOUSE 51: Chris Harris 12+1, Scott Nicholls 10+3, Edward Kennett 9, Ellis Perks 6+1, Robert Branford 6, Davey Watt 5, Stuart Robson 3+2. WOLVERHAMPTON 41: Kyle Howarth 13+1, Fredrik Lindgren 9+1, Adam Skornicki 7+1, Sam Masters 6, Jacob Thorssell 5+1, Nathan Greaves 1, Max Clegg 0.